Ahly assistant coach Mohamed Youssef has said ahead of his team’s upcoming Friday match against Tunisia’s Esperance that the two teams enjoy “strong ties” despite a refereeing controversy that arose during their last match on Friday. 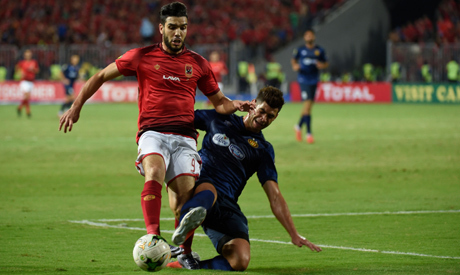 The controversy arose after Algerian referee Mehdi Abid Charef awarded Ahly two penalties in the first leg in Alexandria, to the dismay of Esperance players, who thought the penalties were harsh. Ahly took a comfortable advantage after beating Esperance 3-1. Charef stood by his decision after consulting the Video Assistant Referee (VAR). However, the Tunisian Football Federation (FTF) held an emergency meeting of its disciplinary committee on Saturday following the refereeing controversy, and lodged a complaint with the CAF against Charef. "We ask the CAF to announce immediate decisions against the Algerian referee after his bad performance during the game," read a TFF statement. The Cairo giants will be hosted by the Tunisian side in the return match of the CAF Champions League final. Youssef told an Egyptian radio station on Sunday, "we know that the first leg was not the best on a technical level, but goals always decide the winner in the finals." "We warned our players of receiving goals, but we finally managed to score three goals," he added. Ahly's assistant coach Youssef assured that the return match will not be affected by the controversy that followed the first match. "We will go to Tunisia just to play football. Egyptian people like their Tunisian counterparts and vice versa. We have strong ties with Esperance and we have been meeting every season since 2009," Youssef explained. "We respect the decisions of the Tunisian Football Federation. They are free to decide their rights," he added. The technical staff of Esperance also accused Egyptian security personnel of negatively affecting the team's preparations for Friday's match after taking a long time to inspect their bus. However, Youssef assured that his team faced the same security measures, “especially after the recent terrorist attack in Minya governorate."